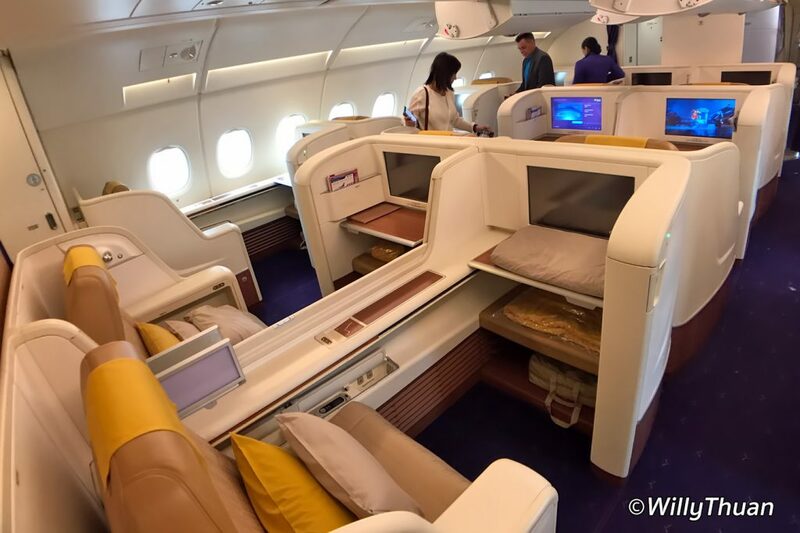 So what is the difference between Business Class and Thai Airways First Class. Obviously the first thing you will notice is how nice and attentive staff is with you, not in a stiff or formal way, real smiles and friendly attitude. 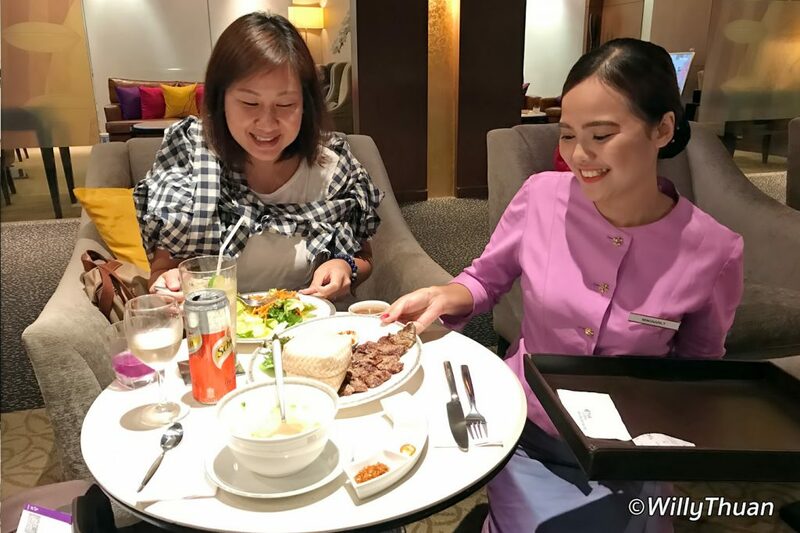 The perks listed below only apply at Bangkok airport because this is Thai Airways in Thailand! Starting from another country you will get access to the first class lounge and priority lane to immigration but that’s a lot less fun features than what you get in Bangkok. 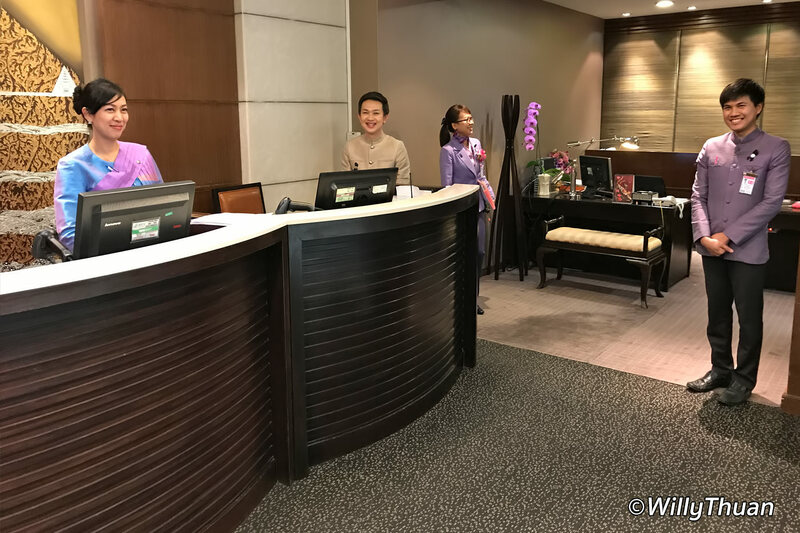 At Suvarnabhumi airport you won’t check in at any counter, you will be invited to a cozy salon area and you will have someone taking care of you and your luggage just like in a high level 5 star hotel. 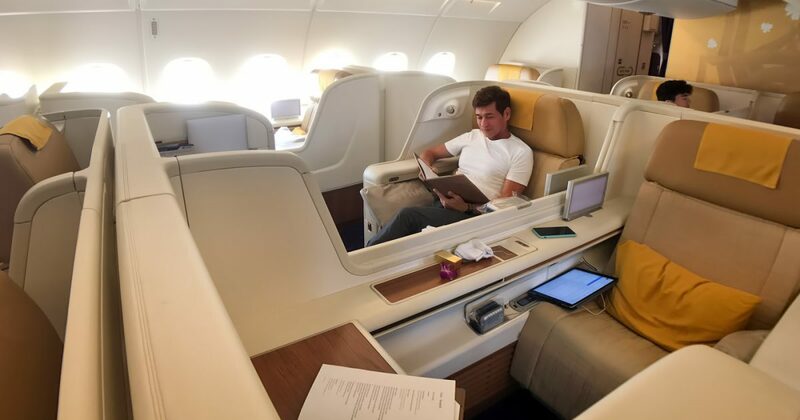 From there you will be personally escorted everywhere: to the fast immigration lane and to the First Class Lounge and later a buggy will drive you to your gate that is usually quite far as Airbus A380 is so large it can only park at the very end of the airport. The lounge is actually a bit similar to the business lounge, just a little more sophisticated and colorful, with some private rooms with huge flat TV screens, and it’s definitely less crowded! 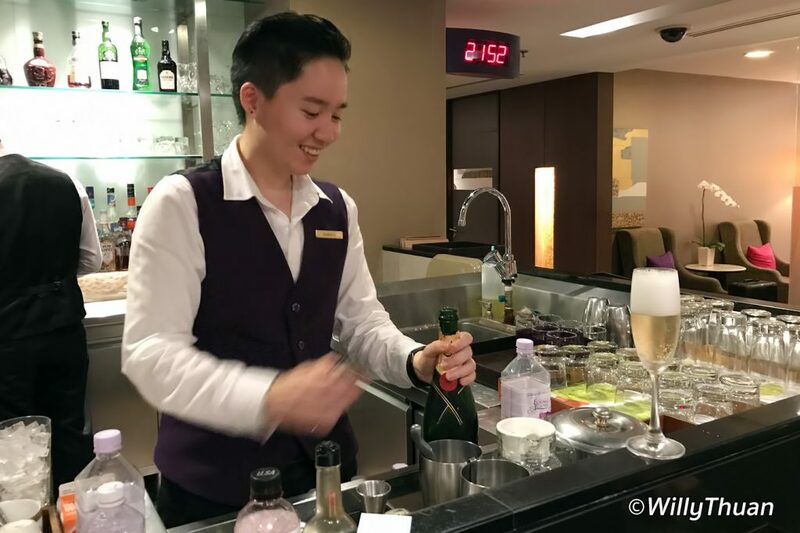 The Thai Airways First Class lounge also has a real bar with a real bar tender! You basically can order any drink or cocktail for free, but Champagne is always a big winner. The team is always smiling and genuinely friendly and the ladies wear beautiful Thai silk uniforms. This is the most fun perk. If you arrive early enough you can request an hour free spa! You get to choose between aromatherapy or traditional Thai massage. Usually I would go for aroma but since we were on long flight I didn’t feel like having any oil so I went for a traditional Thai massage. 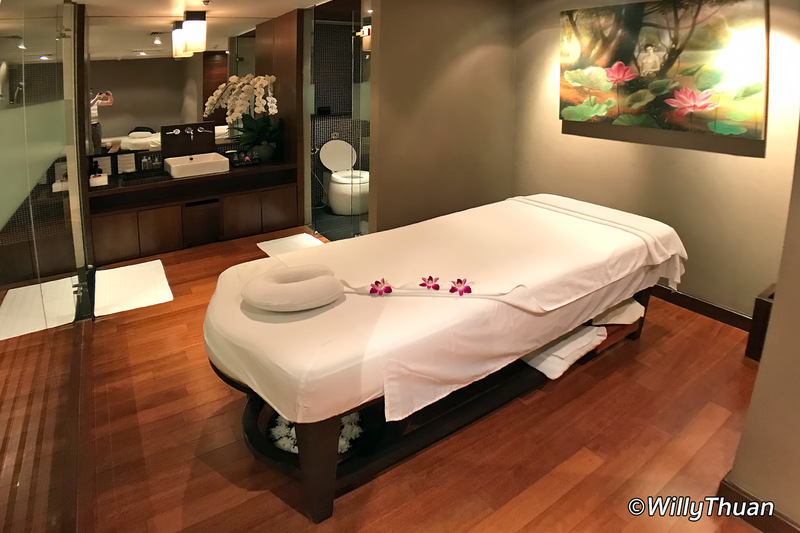 And just like the previous experience we had in business class the therapist was really professional, better than most massage places I went to in my many years in Thailand. (Business class only offers foot massage or shoulder massage). Note that even though you know what time your flight is, you can’t book the spa in advance, it’s ‘first come first served’ but it didn’t seem to be overly busy. Just remember to come a lot earlier if you plan to experience a spa at the airport. 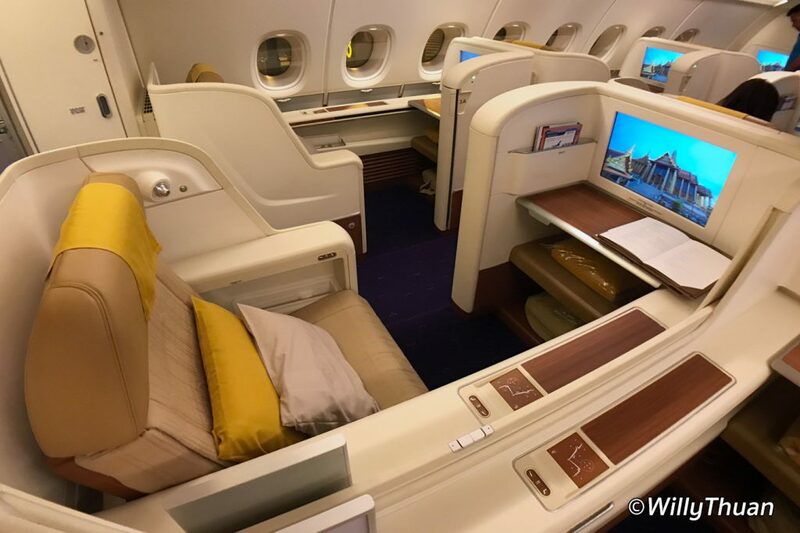 Each plane and each airline is obviously different and each first class cabin has different layouts and features. 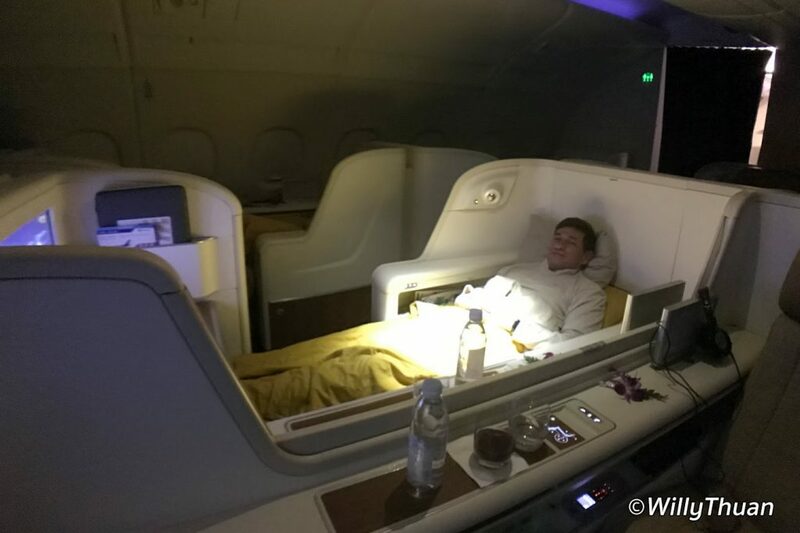 This was an Airbus A380 with rectangular alcoves and large full flat beds. Superbly designed with plenty of storage and 2 USB plugs and 2 electric plugs, a very large sliding 41 x 69 cm table and a large 25″ TV screen (yes it is large in a plane). Separation is good as you can raise an electric panel to isolate yourself from your closest neighbor if you are in the central area. The 25″ screen with noise cancelling headset will allow you to enjoy plenty of good movies, including the usual set of new releases. It will keep you happily busy on the way to your destination but you will most probably get the same movies on the way back! When the time is right a cabin attendant will prepare your bed for the night: flatten your bed entirely, place an extra thin mat for your comfort and add blankets and pillows. And yes, they also supply pajamas and a changing room! I tried the pajamas and it was a little too warm for me but I loved the feeling of being in a real bed. The cabin crew really come and check if you are comfy, just like in the commercials! 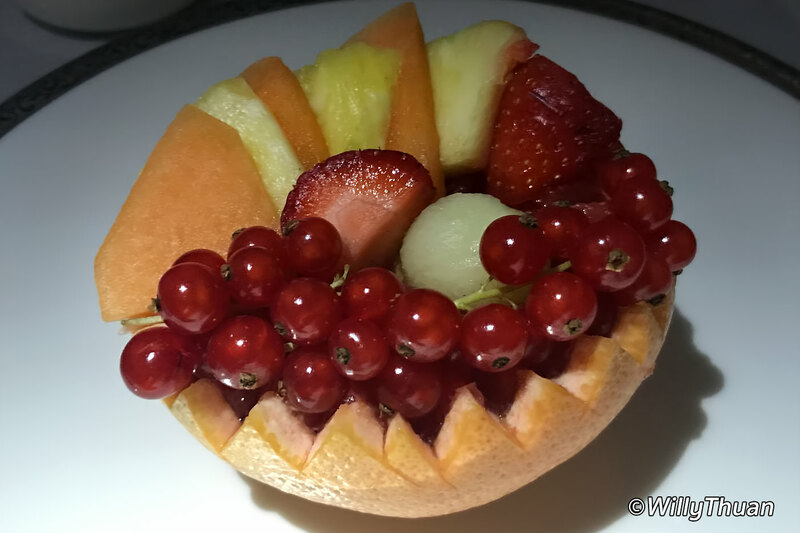 From the moment you walk inside the plane it’s all about pampering you. You get warm towels, as many glasses of champagne as you want as long as you don’t appear overly drunk, and plenty of little canapés. The meals are the highlight of the flight and these are real 5 course dinner beautifully served. 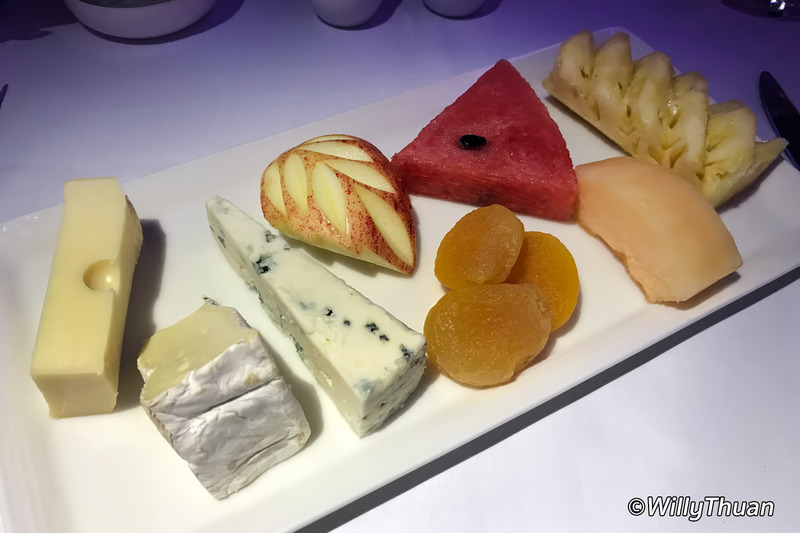 On First Class Each dish is served with real plates and real cutlery (no plastic here!) and your 41 x 69 cm table is large enough to make you feel like in a restaurant (except that I fell asleep in the middle of my meal once!) 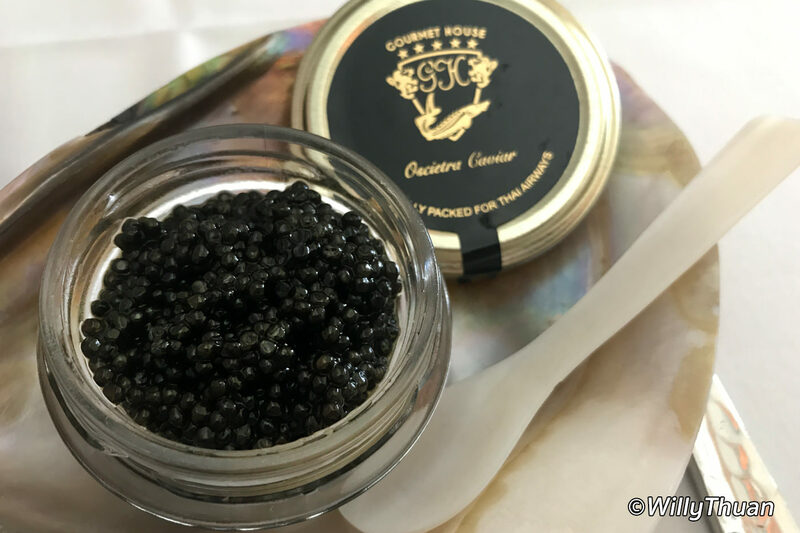 There is an on-board menu to choose from with 2 or 3 different main dishes but you are encouraged to order in advance online from a much wider menu selection. 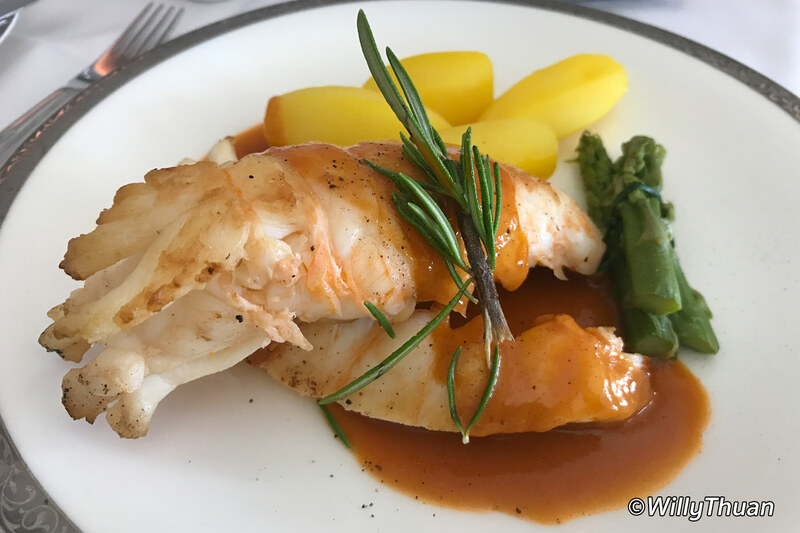 In both flight from and to Paris appetizers, cheeses and sweets were great but the main dishes were so-so, the lobster was really hard. They even serve you real espresso, not that long tasteless coffee. 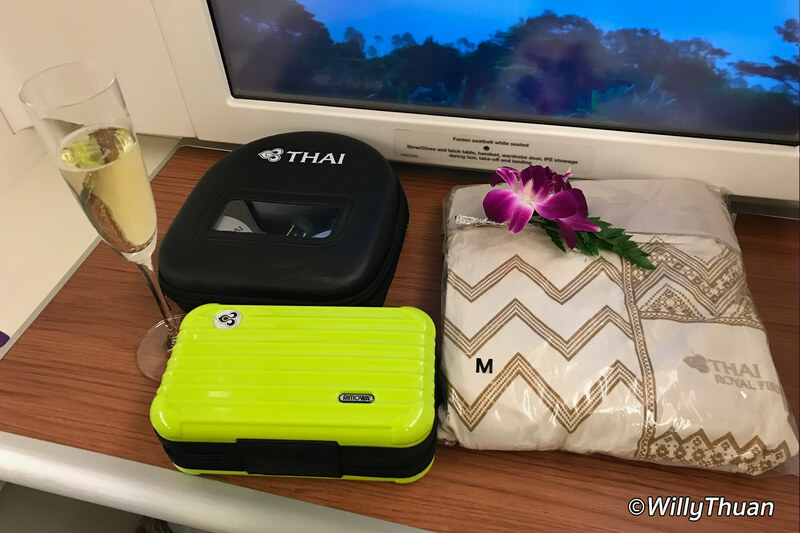 The little pouch on First Class Thai Airways! Always fun to get that little bag of freebies in business class but in first class you get a really beautiful little RIMOWA hard case, which means 2 if it is a return flight! We got a green one and a grey one and the content were actually different! Inside your pouch you will find: Brush and comb, slumber shade (that black mask you wear to sleep), cotton buds, Evian facial mist, moisturizer, toothpaste, toothbrush and mouthwash, lip balm and weird comfort socks. + 20 MB free internet access. Yes of course you are expected to brag to as many friends as you can within 20 Mb, and trust me it goes fast (you get 5 Mb on Business class). If you want more, you’ll have to pay and it doesn’t come cheap. What strikes the most? As soon as you are in your seat, you entirely forget that you are actually in a plane. This is a 10 hours pampering, play with the toys, eat a lot, drink quite a lot and sleep if there is enough time left after that! You even wish the flight could be just a little longer so you can finish that movie. Of course it doesn’t come cheap but you arrive fresh for a new day so you actually save valuable time and you don’t feel lousy. Want to know how much it costs? 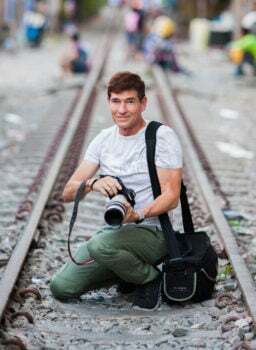 Go to Thai Airways Website and find out!